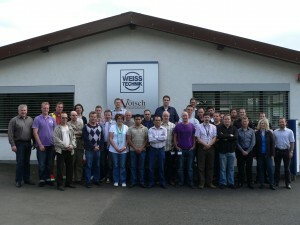 Captioned Butler Engineers attend at Weiss 2011 Training with our partners Weiss Technik producers of Climate and Laboratory test chambers. Based in Reiskirchen-Lindenstruth, Germany, Weiss Technik is one of the most important producers of standard testing chambers and systems for environmental simulation worldwide. The product range comprises temperature and climate testing systems as well as test systems for simulated exposure to weather, temperature shock, corrosion and for long-time testing in various test chamber volumes. Walk-in /drive-in chambers and process-integrated plants for environmental simulation and biology are designed, produced and installed in accordance with customer specifications. For further Information on our Weiss products please click on Environmental and Process Test Section of our website or please contact Frank Cass on +353 1 6292620 or email sales@butlertech.ie.